The 24 Larson Cabrio is a great cruiser that comfortably sleeps four in air-conditioned comfort. The shallow draft allows you to pull right up to the beach for a day of water sports. When it's time to get out of the sun the Twin Bimini top keeps the cockpit in the shade. The deep-V hull cuts through the water while delivering outstanding on-plane performance.Be sure to see this fine vessel.This is a two-owner boat . The engine has been serviced. Outdrive has new gimbal bearing and all boots have been replaced. 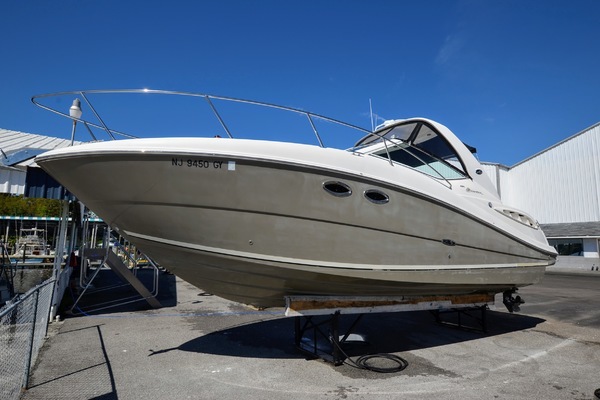 United Yacht Sales New Jersey would love to guide you through a personal showing of this 24' Larson Cabrio 240 Midcabin 2005. This yacht for sale is located in Merritt Island, Florida and priced at $24,900. For a showing please contact us by filling out the form on this page and we will get back to you shortly! Standing head room in the cabin, convertible dinette forward with table down provides a huge berth, shelving on port and starboard, large hatch overhead, aft port is the galley, to starboard is the enclosed head compartment and shower, mid-ship cabin features large berth with privacy curtain. The cockpit has comfortable seating, wet bar, walk thru transom, large swim platform. Going forward is safe and secure with the walk-thru windshield, stainless steel rails, two bimini's with camper canvas and mooring cover. The Larson 240 Cabrio provides a weekend getaway, boat is in turn key condition and nicely kept. Call today for a showing appointment.